Real Madrid has had their fair share of talented players that for one reason or another were never able to retain a prominent spot in their senior squad. While talented they were not able to get playing minutes on the team and in some cases not even a spot on the bench. Their decision to move elsewhere has paid its dividends since they have been able to flourish in different surroundings. Here are seven of those players. 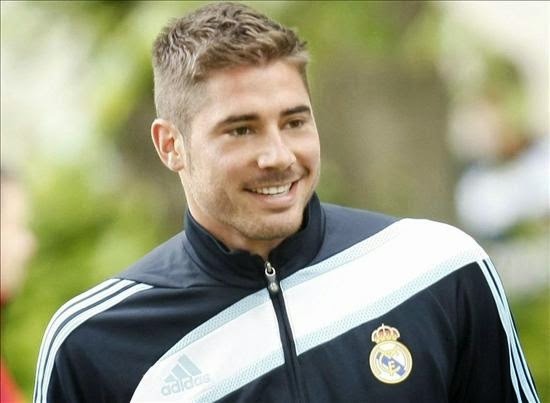 The young Spanish forward was never able to crack the senior squad at Real Madrid, playing mostly for their reserve squads and eventually their B team. In 2010 Benfica signed him and it proved to be the change that he needed in his career. In 67 appearances for Benfica, Rodrigo scored 27 goals. Last season he would end up winning the domestic treble for Benfica and appearing in his second Europa League final. His performances attracted attention of several clubs, but Valencia would end up signing him at the start of this season, allowing him a move back home and to a more competitive La Liga. Javi was another player that Benfica was able to pick up from Real Madrid and give him a new opportunity in his career. Javi spent 8 years in the Real Madrid academy, before joining Real Madrid B where he played for 3 years. After a stint at Osasuna he returned to Real Madrid, but in 2009 Benfica came knocking and signed the Spaniard. He had an incredible first season and his performances and status in the team kept growing in importance, until 2012 when Manchester City came to Lisbon and signed the Spanish international, taking him to higher flights. 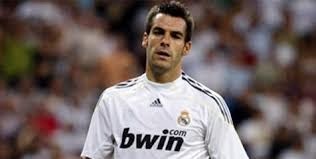 Negredo was bought from Rayo Vallecano at the age of 20. He was developed as a striker and in 65 games for Real Madrid B he scored 22 goals. It wasn’t until he moved to Sevilla that his career really took off. Never been given a chance of regular first team minutes at Real Madrid he used the opportunities well at Sevilla and became a prolific goal scorer. In 2013 Manchester City signed him from Sevilla, in order to help their front line. He hasn’t had the same amount of time on the field as he wishes but he finished last season on a positive note. Cambiasso spent two years as a teenager at Real Madrid's academy, before making a return to Real Madrid in 2002 when he was 22 years old. He made 41 appearances for Real Madrid but failed to score a single goal. In his two years in Madrid he never showed his true potential and it wasn’t until he joined Inter Milan in 2004 that he would re-launch his career. Soldado had four incredible years with Real Madrid B. From 2002 to 2006 he had 120 appearances and scored 64 goals, but considering the fact that Real Madrid during that time had forwards like Raul, Ronaldo and Nistelrooy it was hard for him to earn any playing time with the senior squad. He would be loaned to Osasuna, and eventually sold to Getafe, but it was at Valencia that he set himself apart and showed what a great goal scorer he is. In 2013 he moved to Tottenham in England but as found it difficult in London. 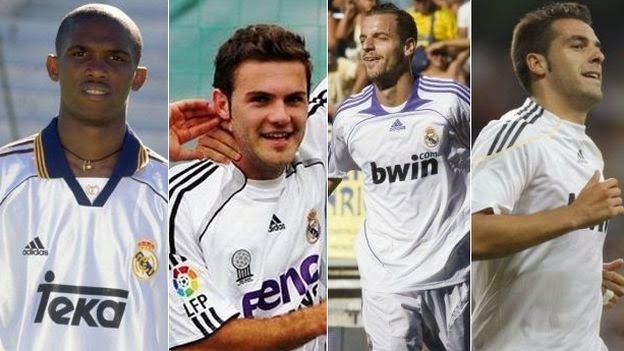 Mata joined the Real Madrid academy in 2003, at the age of 15. By 2006 he was already playing for Real Madrid B in what was an incredible clime for the young midfielder. In 2007 Valencia paid his release clause and took him away from Madrid. At Valencia, Mata would establish himself as one of the best Spanish midfielders of his generation. He would eventually move to the Premier League when Chelsea signed him in 2011. After a successful stay in London, last season he made a move to one of England’s giants, Manchester United. Eto’o joined Real Madrid academy in 1997, but since he was a minor he could only train with Real Madrid B. When they were relegated to the third tier of Spanish football he was loaned out to CD Leganes since in the third tier of Spanish football you can’t have non-European players. During his time in Madrid he was loaned out three times, failing to impress during his loans and his time at Madrid he would end up making a permanent move to Mallorca. His career would start to move forward from that time on, but it wasn’t until his arrival at Barcelona that he would become the star that he is right now. Last season he played for Chelsea but he has been released during this offseason. 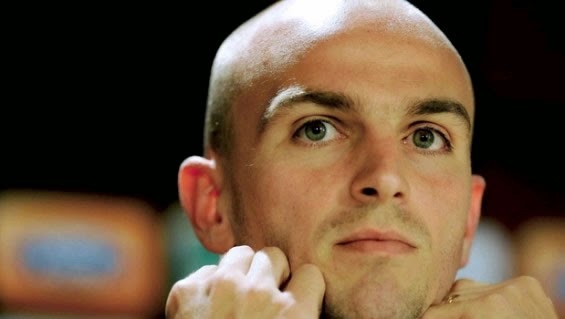 you do realize, that that picture of Cambiasso is actually Wesley Sneijder?